Midnight Mass at St. Joseph, Detroit Choir and chamber orchestra will perform Missa Jesu, Salvátor Mundi by Vito Carnevali. Prelude begins at 11:00 PM. Your prayers are requested for the repose of the soul of Christian Caubet, who passed away earlier this month. Christian was a long-time member of Windsor’s St. Benedict Tridentine Community Choir, where he sang bass. Originally from Paris, Christian had been a member of the Assumption Church Parish Choir before beginning to sing for the Latin Mass. His was a familiar, resonant voice throughout our region, as he traveled around the area to sing for special occasions at St. Josaphat and Flint’s All Saints Church, among other places. Requiéscat in pace. Over 270 of the faithful attended the Pontifical Mass in the Extraordinary Form on December 6 celebrated by Bishop Earl Boyea of the Diocese of Lansing at Jackson, Michigan’s St. Mary Star of the Sea Church. St. Mary is one of Michigan’s best-preserved historic churches, grand in scale and ideally outfitted for the Traditional Latin Mass. Bishop Boyea is an experienced and enthusiastic celebrated of the Tridentine Mass, having started to offer it in 2005 at St. Josaphat Church while an Auxiliary Bishop of Detroit. Altar servers from Windsor’s St. Benedict Tridentine Community and the Oakland County Latin Mass Association were privileged to have been invited to serve at this Mass. One of the most impressive discoveries at this Mass was the recently formed quasi-professional choir. 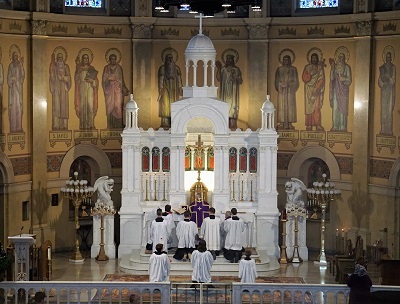 Under the direction of Bill Price, Jr. and including long-time Tridentine Mass organists Jeff Mausolf and Sipkje Pesnichak as members, the new Jackson Tridentine choir sings polyphony at every Mass. 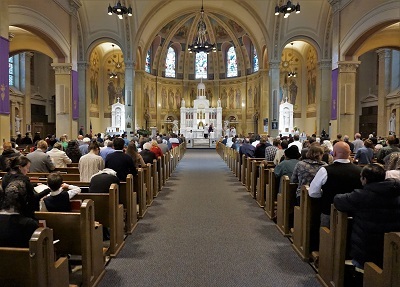 Not surprisingly, the combination of the move to St. Mary’s and the newfound commitment to sacred music has resulted in a doubling of the Sunday Mass attendance at the Jackson Latin Mass. Bishop Boyea deserves thanks for encouraging the move to this lovely church, as well as the recent move of the Flint Tridentine Community to the comparable St. Matthew Church. Holy Mass in the Extraordinary Form is offered at 12:15 PM each Sunday at St. Mary Star of the Sea.